Good morning, and happy Monday to you! I hope you had a wonderful weekend. My weekend wasn’t great, simply because I had some very important, very pressing non-decorating, non-condo-related things I had to attend to that virtually ate up my entire weekend. Not fun. Not fun at all. I did take a couple of hours on Saturday morning to go to one garage sale. I knew I didn’t have much time, so I couldn’t just drive from garage sale to garage sale. No, with my limited time, I was forced to choose. I had to be satisfied with only one garage sale. So I looked on Craigslist, and found one that looked enticing: “Huge Girl Scout Garage Sale.” Okay, I like huge garage sales. And I really liked the fact that over 20 families had contributed items for the sale. Wow! How could I pass that up!? It was going to be incredible, right!? No, I don’t mean eight dollars each. I mean eight dollars for the pair!! Let me show you what eight dollar chairs look like. Can you believe that?! I’m always complaining about how my city’s Craigslist is absolute nonsense. Evidently I live in one of those cities that is filled with delusional people who think they can sell their five-year-old Walmart bookshelf, made of particle board and laminated paper printed to look like wood, for the “bargain” price of $100. It gets really irritating. But garage sales are different. Garage sales…are…AWESOME!! And did you happen to notice the fabric on these chairs? The colors of these chairs?? 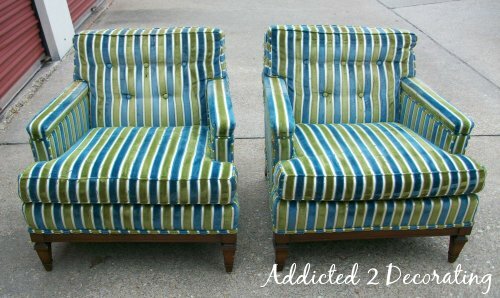 I literally could have put these right into my little condo, and they would have looked like they were custom upholstered just for my living room. The sad thing is that the previous owners evidently had a cat, and kitty had claws. So they will definitely need to be reupholstered…sadly. Right now they’re tucked away in my storage building, but since most of the kitty scratches are on the back, and since this upholstery would look fabulous in my condo, I might just go ahead and use them as they are until I have the time and money to reupholster them. Maybe I can place them strategically so that the scratches don’t show. I would love to upholster them in the exact same fabric. Do any of you have any idea what this fabric is? Well, whatever it is, it’s perfect for my condo! 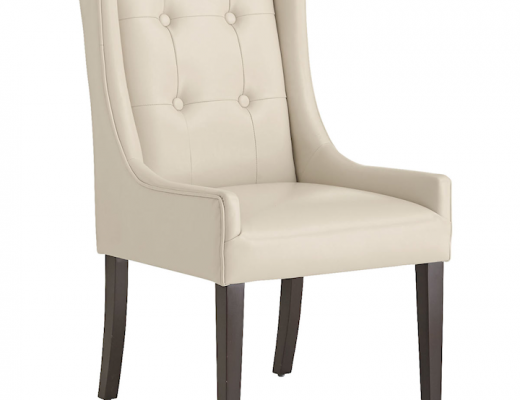 Just take a close-up look at the chair with the valance/drapery fabric. I simply must find that fabric, don’t you think? And now for the winner of the Quote the Walls giveaway! Congratulations, Jen! 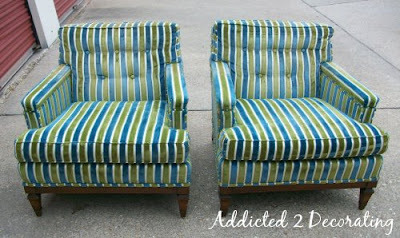 Just shoot me an e-mail at addicted2decorating[at]live.com and I’ll get your prize to you. Well, I hope you have a very blessed Monday. P.S.–I still haven’t heard from the winner of last week’s Chic Shelf Paper giveaway! Susanna, I need to hear from you by Wednesday, May 5th, or I’ll have to give your prize to someone else. 🙁 I really don’t want to have to do that. Sure, it’s one of those pieces that a DIYer could spiffy right up with a fresh coat of paint, maybe some pretty wallpaper or other paper decoupaged to the top, or whatever. But let me make this clear…this IS NOT a buffet. 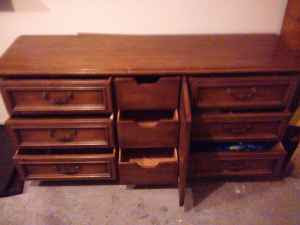 This is a dresser…for a bedroom…the purpose of which is to store clothing. And based on the style, it’s probably about 30 years old, at least. 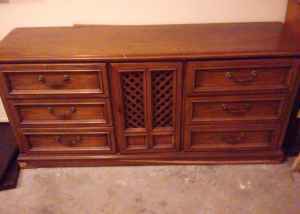 And how much is the seller asking for this “traditional buffet server”? Delusional. There’s no other word for it. Matt suggested that I contact the seller and ask if the price is in pesos. lol…oh my…he makes me laugh. Next Post Out of Curiosity:: How Much Is Too Much For Fabric? ok, now I am in awe!!! Those chairs are amazing. I am blown away that you got them for 8 bucks!!! That is what I love about treasure hunting…you found a great treasure! Ohmygoodness! I am green (or, rather, blue and green striped) with envy! 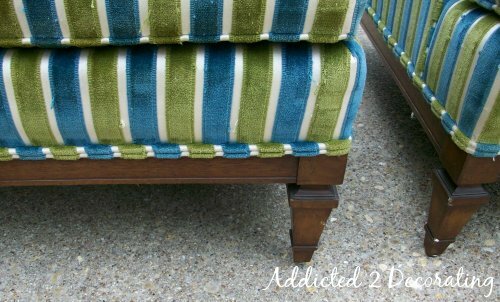 If you can't find that exact fabric, you might wanna consider finding a solid that matches one of the stripes just to cover the back? 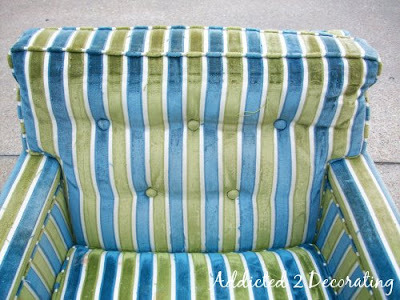 It'd be a sad thing to lose those awesome stripes altogether – what awesome chairs!! Agree with the comment about our fair city's Craigslist. If it was ugly even 15 years ago when you paid $500 for it, it's not a bargain to sell it for $250.00 now. GEEZ!!! I am loving those chairs! 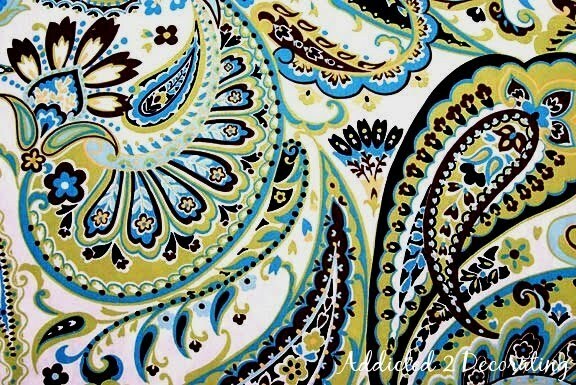 It's a shame they have kitty scratches, the colors are already gorgeous, but I definitely love the paisley print! Try checking with the manufacturer of the chairs to see if they have any of the fabric or what mill produced it. 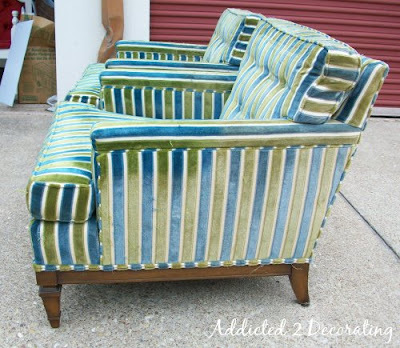 Also, since the middle of the backs look good, you could use the good fabric from both chairs to upholster one and place the back of the other chair with a solid fabric against a wall. What a great find, they are perfect with your valance. Karintha and Tee, the idea of using a solid on the back is a great idea…except that kitty clawed more than just the back. It doesn't really show up in the pictures, but there are spots all over where kitty scratched. What I WILL do…at minimum…is remove the fabric carefully when I'm ready to reupholster, and that way I can salvage the larger pieces for use elsewhere–throw pillows, maybe even my dining chair seats, etc. Ellen and SG, I'm glad to hear that others share my frustration with our Craigslist!! It's so disheartening to read other blogs where people find these amazing bargains and wonderful pieces, and then I look and see nothing but Ikea, Walmart, and Ashley furniture. And the items that actually ARE somewhat decent are way overpriced. Ellen, I'm cracking up. I just saw your post on Craigslist. lol…oh, I can't count the number of times I've wanted to send e-mails to sellers expressing the same thing. I am still in awe. Beautiful chairs……..just for $8.00. You have a prize treasure it. Great find- and you are right the fabric is perfect for you. Sorry to say I am not familiar with the fabric. Good luck hunting. "then I look and see nothing but Ikea, Walmart, and Ashley furniture." Ellen, I got so sick of all of the Rustic furniture and the Ashley furniture that now all I look at is the "furniture–by owner" postings. Those things with all of the Texas stars on them are just a bit much for me. Be sure to check out the "Edit" I just added to the bottom of this post. lol…it's just ridiculous. 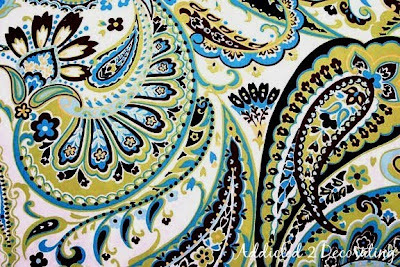 I don't know what the strip is but you have to tell us where you got the paisley! The pattern is called Somerset, the color is Jade, and the company is Braemore. You should be able to find a vendor if you Google "Braemore Somerset Jade." You did a great job in finding nice stuff! Beautiful chairs! Ooooh! I love the chairs! I can't believe you scored such a great deal, I'm jealous. Craigslist here is ridiculous, people ask insane amounts for such pieces of junk. It annoys me to the point where I don't even bother looking on CL anymore. Hmmm… 8 bucks for two chairs, I don't really understand why they just didn't give them to you for free. 8 dollars don't seem to buy much nowadays. If they put those chairs out on a street in New York, they would be gone in 30 seconds. Ok, so I couldn't sell the "traditional" IKEA buffet for $29 less than what I paid for it, and I have to get rid of it ASAP, because I'm moving, so what will get rid of it? How about selling it for $21 MORE than I what I paid for it!! Yeah, they do that in my town too… I wonder "what are you thinking, asking nearly what you paid for that couch, although you bought it 5 years ago?" LOL. I bet we live in the same city. My craigslist is crazy. You should see some of the prices for the couches that look like crap. If the scratches are only in the back, what about just changing the back fabric in a coordinating color??? Just a thought! I Love garage sales!! The fabric is by Braemore-Somerset Jade…I'm using it in my nursery. Good luck! Perhaps saving a bit of the chair fabric to make pillows to compliment the new upholstery.